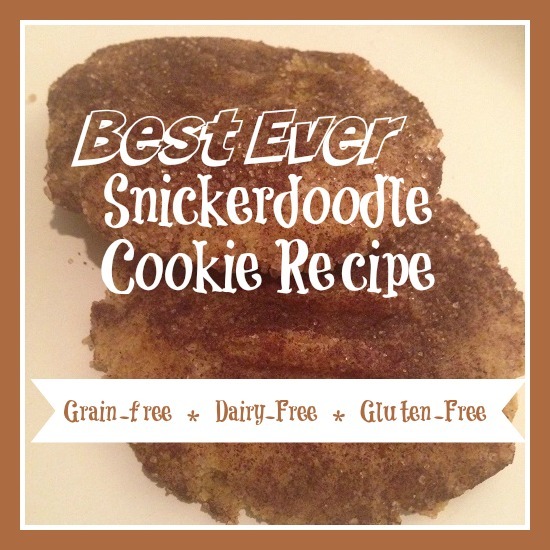 The best ever snickerdoodle recipe we have found makes grain-free and dairy-free cookies made with almond flour and pumpkin. They are a perfect sweet treat. However, at our house we allow some treats like this as long as they stay grain-free and dairy free so these work for us! Just a warning though…they don’t last long around the house. They usually don’t even last a day at ours! In a medium size mixing bowl, blend together almond flour, salt, baking powder, and pumpkin spice. In a separate small bowl, mix together coconut oil, canned pumpkin, maple syrup, and vanilla. Mix all the ingredients together into the larger bowl. Place in the refrigerator for about 15 minutes to allow the dough to become more firm and easier to shape into cookies. In a small ball, mix cinnamon and turbinado sugar. Coat cookie balls into cinnamon/sugar mixture. Place on an ungreased cookie sheet and then flatten them with your hand until they are about 1/4 inch thick. Bake cookies for about 12 minutes until cooked through. Allow to cool completely (if you can wait) on the cookie sheet before serving.